We have one of the very first images of the new Panoz Abruzzi in a livery based off the old 1996 Panoz GTR-1 (which I designed). We also have one of the first images of the new ACS Racing Ford GT along with the Porsche 911 GT3-R Hybrid and the Audi and Peugeot LMP1 cars. I wanted to express a huge thanks to the ALMS and virtually all the teams who have helped during the season, helping to make the guide such a fan sucess. For the fans as the old ALMS Strapline says. I also want to thank Marhsall Pruett, Ryan Smith, John Dagys, Richard Prince and Martin Spetz for all their help in collection reference and information for the guide. It would have been possible without their help. A special thanks to John Hindhaugh and Radio Le Mans for the plugs on ALMS Radio and Midweek Motorsport and Ell Perry who always posts the previews on a number of forums. If you intend linking to the guides then please respect the efforts of Andy and Spotter Guides and link to this page not directly to the guides. Thanks also go to our partners this year, Ten-Tenths.com, Radio Le Mans, SpeedTV.com, American Le Mans Fans, Fourtitude, Speedhunters and the American Le Mans Series who publish the guide on the website as their Official Guide. You can also follow updates via Facebook (see link on left hand side), or our partner websites. I will probably publlish an update on Thursday evening (EST).Many thanks for your continued support!!! 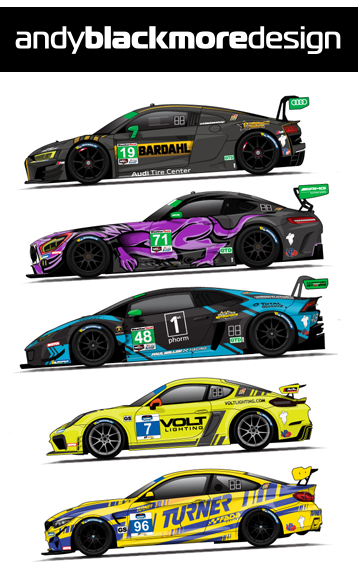 NEW- As an official partner for the Spotter Guides, the American Le Mans Series have launched t-shirts and a Print of the 2010 Spotter Guide. These are available at their online store and ALMS outlets at the circuit.